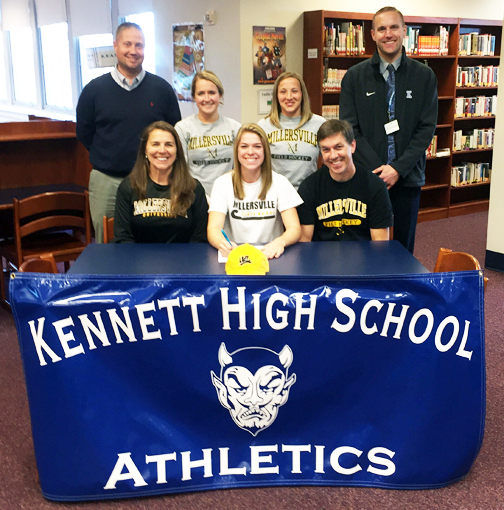 Kennett High School celebrated senior Jordan Goddard signing her National Letter of Intent to play Division II field hockey at Millersville University. Jordan was surrounded by her parents, Eileen Goddard and Mark Goddard, as well as by her Principal Dr. Jeremy Hritz, Head Coach Meghan Shumway, Assistant Coach Kristen Kotler, and Athletic Director Sean Harvey. Jordan has been a member of the Kennett High School’s varsity field hockey team since her freshman year. As one of the best midfielders in the county, Jordan has had a phenomenal field hockey career with the Blue Demons. During her sophomore year, Jordan was named to the All-League Second Team. Jordan continued having successful seasons, when she was named to the All-League Second Team and named team MVP and Best Offensive Player in her junior year. Jordan’s most successful season as a Kennett High School field hockey player was her senior year. Jordan was named to the All-League First Team, was named team MVP, was a Booster’s Club Award recipient, and was ranked as the lead scorer on the team with 14 goals and 10 assists. Jordan also plays on a club field hockey team where she is primarily a defender. Jordan will continue her education at Millersville University, where she will study psychology. After completing her undergraduate work, Jordan plans to get her Master’s Degree in Speech Pathology. 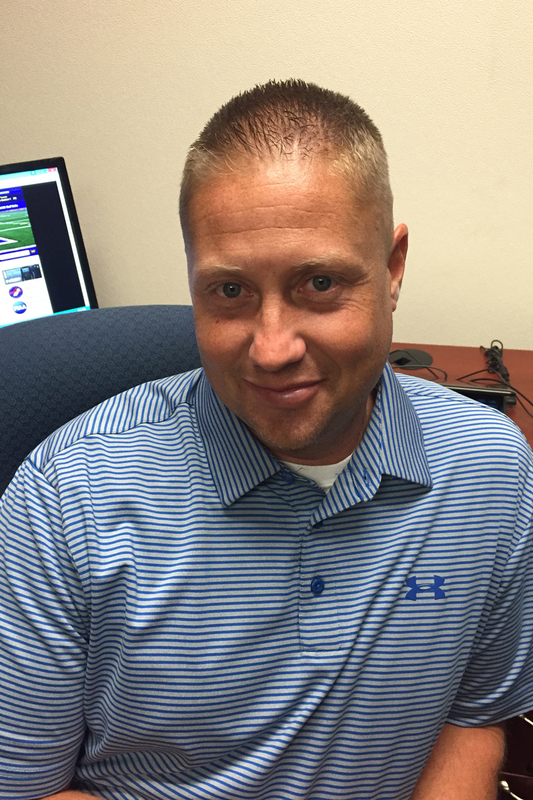 Kennett Consolidated School District is pleased to introduce Mr. Sean Harvey as the District’s new athletic director. Mr. Harvey brings 10 years of experience to his new role. Prior to joining Kennett Consolidated School District, Mr. Harvey worked at Oxford High School for 17 years. During his time at Oxford High School, Mr. Harvey taught social studies for 17 years and was the athletic director for 10 years. Mr. Harvey also coached Oxford High School’s boys’ basketball and baseball teams. Mr. Harvey earned his Bachelor of Science from West Chester University, where he majored in social studies and secondary education. When he is not working, Mr. Harvey enjoys spending time with his wife, Nicole, and their two children, Elizabeth and Chase. Mr. Harvey also enjoys reading and watching college basketball and baseball. The Kennett Consolidated School District would like to extend a warm welcome to Mr. Harvey. With Mr. Harvey’s ambition and experience, the future of the District’s athletic program is bright. Each year, the lobby of New Garden Elementary School is transformed into a winter wonderland of giving. During the holiday season, the lobby has been home of the Mitten Tree for 20 years. 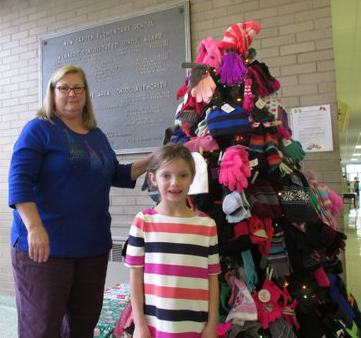 This 20-year-old tradition invited students and faculty to add their donations of scarves, hats, gloves, and mittens to the tree throughout the month of December. The generous donations were then distributed to students in need. Who gives and takes from the Mitten Tree varies from year to year and is always kept confidential. The New Garden Elementary School lobby also acts as a drop-off site for Toys for Tots and canned goods for the Kennett Food Cupboard. In fact, multiple schools in the Kennett Consolidated School District are designated donation areas for Toys for Tots. Kennett High School’s National Honor Society also arranged a donation area at the high school to collect toys for Toys for Tots. 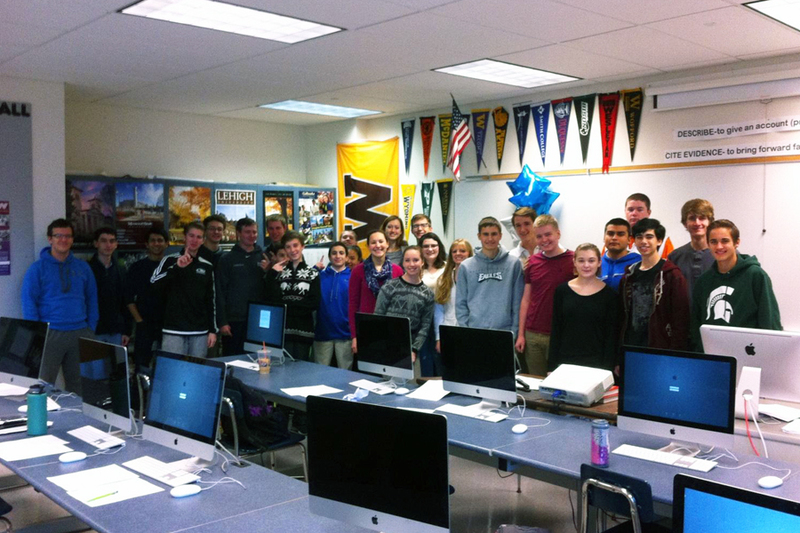 This year, Kennett High School’s Humanitarian Club held its annual food drive to benefit Kennett Food Cupboard. The Humanitarian Club participated in many different fundraising activities. Students asked for canned good donations, sold hot cider and cocoa, held a “Pie the Teacher” contest, and walked in the March to End Hunger. Overall, the Humanitarian Club collected more than 2,000 canned goods and donated more than $500 to the Kennett Food Cupboard. 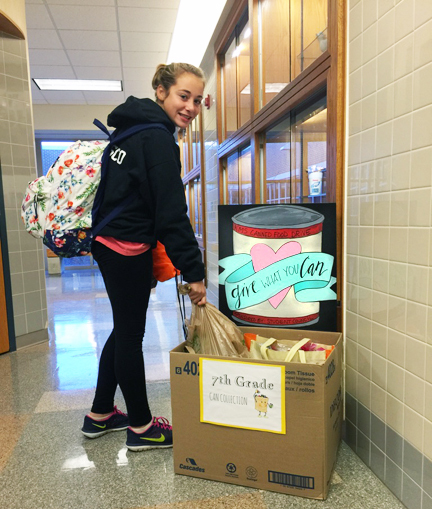 Over at Kennett Middle School, the student council successfully hosted their annual Student Council Canned Food Drive. Together, students in grades six through eight collected 396 cans to be donated to the Kennett Food Cupboard. There was even a friendly competition to see which grade could collect the most canned goods. The eighth grade “won” the competition, with a total of 187 cans collected. In second place, was the seventh grade class with a total of 108 cans collected, and with a close third-place finish, the sixth grade collected 101 cans. Kennett High School continued tradition and held its annual Holiday Turkey Drive. Organized every year by social studies teacher Mr. Shawn Duffy, the Holiday Turkey Drive provided turkeys to families in need. This year, Kennett High School students and faculty collected 40 turkeys. Holiday Helpers at Greenwood Elementary School worked together to benefit the Kennett Food Cupboard. Led by art teacher Mrs. Meghan Bergman, 20 students in third, fourth, and fifth grades met after school and created and decorated clay bowls. Making clay bowls to help the community was inspired by the internationally recognized Empty Bowls Project. This project allows participating artists and groups to create and donate bowls to help feed those in need. This activity infused service and teamwork, as students worked together to finish the bowls rather than working on one single bowl individually. The clay bowls that the Holiday Helpers and Mrs. Bergman created are now on display at the Mala Galleria in Kennett Square. 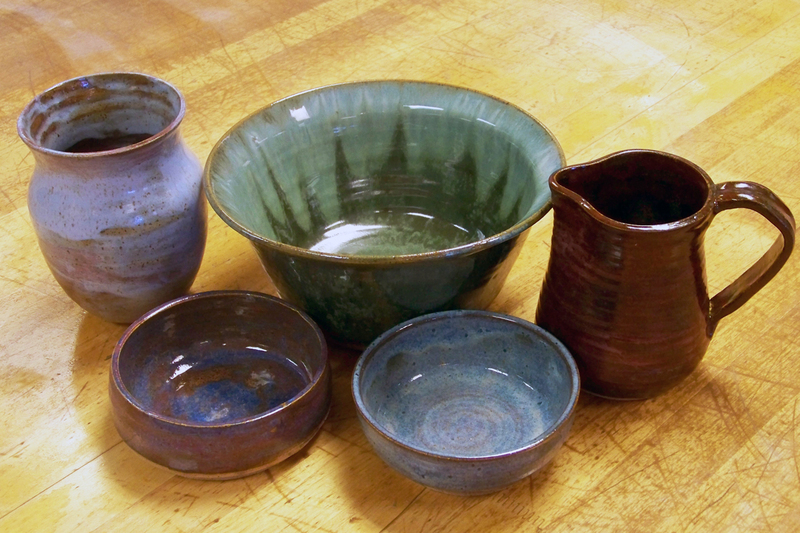 Student-crafted bowls can still be purchased, and all proceeds will go to the Kennett Food Cupboard. 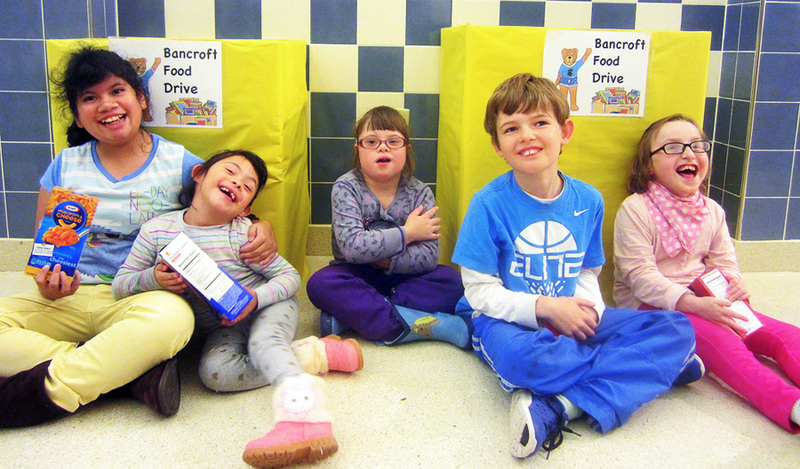 Bancroft Elementary School hosted their annual food drive with great success! During the months of October and November, Bancroft Elementary School’s Life Skills students collected and counted all donations. This year, Bancroft Elementary School’s families generously donated over2,000 nonperishable food items to the Kennett Food Cupboard. Holiday spirit filled the halls of Kennett Middle School as students and faculty participated in holiday service projects benefiting Adopt-A-Family. Raising money for Adopt-A-Family helps people in need receive presents during the holidays. Kennett Middle School’s sixth grade class held their annual Adopt-A-Family Dance in November. There was almost 100 percent participation from the students attending the dance. Special items such as glow bracelets, necklaces, and glow eyeglasses were available for purchase along with refreshments. All sixth grade teachers helped by making commercials for the morning announcements, providing the music, selling tickets, showing off their fantastic dance moves, and generating enthusiasm for this great cause. Together, Kennett Middle School students and faculty collected more than $1,500 to benefit the school’s Adopt-A-Family program. Kennett Middle School seventh grade students and teachers participated in a friendly Jeopardy-inspired competition called, “Are You Smarter Than a Seventh Grade Teacher?” to raise money for the Adopt-A-Family program. Seventh grade students donated $3 to attend the event, where both student and teacher participants were quizzed on topics ranging from pop culture to Kennett Middle School trivia. Chances to become a student contestant could be obtained by purchasing raffle tickets. Approximately 30 students participated as contestants and “Are You Smarter Than a Seventh Grade Teacher?” was a success! The seventh grade class raised more than $1,000 for the school’s Adopt-A-Family program. Kennett Middle School’s eighth grade class combined fun, fitness, and service by hosting a student-teacher volleyball game to benefit the Adopt-A-Family program. Students donated $3 to attend the volleyball game, and they also were able to purchase $1 raffle tickets giving them a chance to win a spot on the student team. Students and faculty were not only serving volleyballs, but they were also serving their community! Together, the eighth grade class raised $1,200 for the school’s Adopt-A-Family program. Members of the Kennett Middle School’s Student Council also coordinated a school wide Christmas card-making activity. Students and faculty were invited to design and decorate Christmas cards that were delivered to local nursing homes, including Friends Home in Kennett, Brandywine Senior Living at Longwood, and Kendal-Crosslands in Kennett Square. The Student Council estimated that 800-1,000 Christmas cards were sent this holiday season. What a wonderful way to bring holiday cheer to the community! This year, students at New Garden Elementary School decorated and wrote letters to United States troops stationed overseas. When special education teacher Ms. Felicine Oakes heard that some troops in her nephew’s unit were not getting letters from home, she wanted to help. Students from first grade teacher Ms. Lisa Tash and learning support teacher Ms. Christine Doubet’s classes decorated cards for the holidays using stickers and pictures from recycled holiday cards. The students wrote heartwarming messages such as “Thank you for protecting our country” and “Happy Holidays, hope you come home soon!” Some students even opted to ask the troops questions such as “Do you have a bow and arrows?” This, with no doubt, brought smiles to the troop’s faces. With help of New Garden Elementary School students, the troops received the cards filled with holiday cheer. During the month of December, Bancroft Elementary School hosted a Pajama Drive with hopes of bringing comfort to all of those in need. Bancroft Elementary School collected 200 pairs of new pajamas, in all sizes, that were donated to the United Way and local shelters. To culminate the Pajama Drive, Bancroft Elementary School students participated in a Pajama Day, where students wore their pajamas to school on the last day before holiday break. This year, New Garden Elementary School students and their teacher, Mr. Tim Haddigan, donated blankets to children in need. Together, Mr. Haddigan and his fourth and fifth grade students made no-sew blankets that were donated to Nemours/Alfred I. duPont Hospital for Children. Thanks to their hard work, Mr. Haddigan and his students provided much needed comfort for children in need during this holiday season. 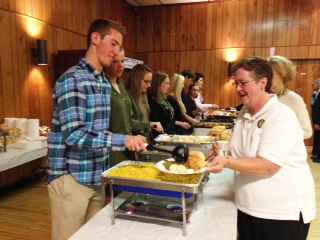 In November, members of Kennett High School’s National Honor Society volunteered to serve veterans at the American Legion Post. Together, the students represented Kennett High School as they set up tables, prepared and served food, and washed dishes. Kennett High School’s National Honor Society also hosted a Red Cross Blood Drive this month. Each year, the National Honor Society hosts two annual Red Cross Blood Drives, one in the winter and one in the spring. During this event, students and teachers volunteered to donate blood, helping not only the Red Cross but many people around the country. This year, seniors Julie Dates, Alex Mark, and Zoe Livingston were responsible for organizing volunteers and signing up students who wanted to donate blood. This is the 16th year the National Honor Society has held a Red Cross Blood Drive. The Kennett Consolidated School District would like to thank all of the students, faculty, and families that continue to support the District’s efforts to help the community. The holiday service projects held this year are a true testament to the Kennett Consolidated School District’s mission of fostering an ongoing collaboration among students, families, staff, and the community. 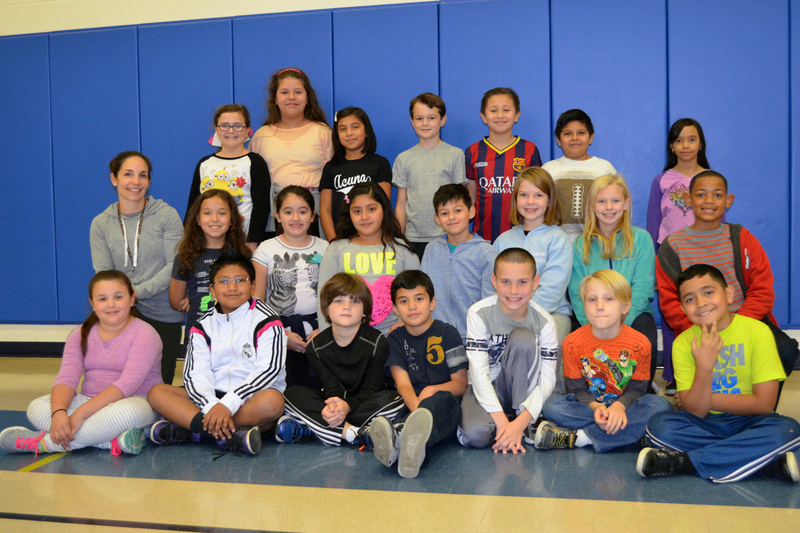 Having a love for fitness and a passion for teaching, Mrs. Leigh Castle (pictured her with one of the classes she teaches) finds her job as a health and physical education specialist both enjoyable and rewarding as she encourages Bancroft Elementary School students to embrace active and healthy lifestyles. Mrs. Castle plays a vital role in her students’ lives as she introduces and educates them on the importance of health and physical education. Mrs. Castle has worked at Kennett Consolidated School District for 13 years. In 2002, Mrs. Castle began her career with the District when she was hired as a long-term substitute at Kennett Middle School. 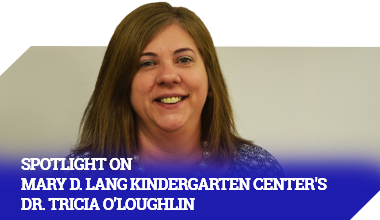 Less than a year later, she was hired as the full-time health and physical education specialist at Mary D. Lang Elementary School (now Mary D. Lang Kindergarten Center). In 2011, Mrs. Castle continued her role as a health and physical education specialist for Kennett Consolidated School District when she transitioned to her current post at Bancroft Elementary School. Mrs. Castle received her Bachelor of Science degree in health science and kinesiology from West Chester University. Shortly after completing her undergraduate work, Mrs. Castle returned to her alma mater, West Chester University, and received her master’s degree in health education. As an advocate for the importance of healthy living, Mrs. Castle enjoys helping with extracurricular activities that promote health and fitness for her students at Bancroft Elementary School. She loves seeing students and their families come out to support the Kennett Fund Run and the Kennett Education Foundation’s Monster Mash Dash! Her students enjoy training for these races during Mileage Club in PE classes, where students earn Toe Tokens for logging laps through walking, jogging, or running. Mrs. Castle also serves on the Building Leadership Team at Bancroft Elementary School. Today, when Mrs. Castle is not teaching, she enjoys spending time with her family and friends. Together, her husband Erik, children Dylan and Sophie, and their dog Ruby enjoy being outside, going to the beach, and spending time on their boat in Sea Isle City, New Jersey. Mrs. Castle is also passionate about CrossFit and living the healthy lifestyle she promotes. At the December 3rd event held at Great Valley High School, Kennett High School’s Future Business Leaders of America (FBLA) team had its most successful Regional Competition in the club’s history. Kennett won 11 first-place trophies in events ranging from Management Information Systems to Hospitality Management to Securities and Investments, and, overall, thirty of the club’s fifty-five competitors qualified for the State Championships in Hershey, PA, to be held in April 2016. “Their results speak for themselves, and all of the teachers who have worked with these students have played a huge role in their academic and social development,” said Mr. O’Sullivan. No need to shop for holiday gifts with hand-crafted quality at an expensive gallery. Instead, come to the Kennett High School Ceramics Sale. Nearly thirty-five pieces, including beautiful wheel-thrown and hand-built mugs, bowls, and vases, will be available for purchase. All works are crafted by students in teacher Jodi Davidson’s Advanced Ceramics I, II, and III classes. Six years ago, Davidson and her students developed this creative way to add to their annual budget, with all proceeds from the sale helping to support the purchase of materials like clay and glaze for future projects. Davidson noted, “The students have created some beautiful work, and the money helps to supplement our program.” Last year’s sale raised $740. The sale will be held in the school’s lobby on December 11, 2015, and will be open to the public from 8 a.m. to 2 p.m. Prices range from $5 to $35.